Reserve Your LiteMat Spectrum Today! While previous versions of LiteMat changed the way we light, LiteMat Spectrum changes everything, from pre-production planning to post-production workflow, allowing a filmmaker’s true vision to become a reality…all while maintaining the great features of the over ten thousand LiteMats in use globally. First and foremost the LiteMat Spectrum is truly a LiteMat at heart. Close to 15,000 units are in use worldwide by users at all levels of experience. It’s the preferred choice for quick setups with its ease of use and vast mounting options. LiteMat Spectrum is build upon these features and adds full-color capabilities, wide-range Kelvin temperature adjustment, +/- Green correction, full spectrum de-saturation of color, REC-709 color-space compliance, and large-format pixel control. We think technicians are going to love it. LiteMat Spectrum can augment its white-light output with color accents. Saturated color can be delicately added with 100 shades of depth. LiteMat Spectrum offers 360 pure accent colors that can be added with 100 shades of saturation. LiteMat Spectrum is built upon the solid foundation of the Cinema Series color-space found in thousands of existing LiteMat and LiteTile fixtures. We added red, green, blue, and amber to augment the cinema chips and extend the systems CCT abilities from 2000K to 11,000K. The key here is the amber chip. It is simply not possible to achieve the best white-balanced color without it. LiteMat Spectrum offers adjustable color correction being of green or magenta hue. Being opposing colors, green is applied to a light when an unwanted magenta cast is present. The opposite is also true, applying magenta when a light produces and undesirable green cast. Building from the most accurate white point possible, we then developed a method that uses that white-point as the method of desaturating color. What is the best method of de-saturating a beautiful red, green, or blue chip? The very best full spectrum, color correct, and white-balanced white light color of your choosing. LiteMat Spectrum is the most camera compliant LED light fixture available. It can accurately reproduce any shade of white that the camera considers correct. That can be anywhere between 2,000K and 11,000K with +/- 8 points of tint correction. LiteMat Spectrum can also augment its white light with color accents. Saturated color can be delicately added with 100 shades of depth. LiteMat Spectrum can also improve post-production workflows. It is the first lighting system to be certified color-space compliant. That means taking the guesswork out of color mixing for digital cinema. It’s unique and patent-pending color processing engine also provides wide color gamut desaturation. The concept of large-format pixel control was born out of the need for an ever growing desire for more granular control of set lighting fixtures on set. LiteMat Spectrum features pixels that are 240mm x 480mm in size allowing you to create compelling lighting effects while remaining simple to operate with just 5 DMX addresses per Spectrum Pixel. LiteMay Spectrum remains compatible with all head-mounted accessories such as PolySkirts, Diffusers, and SnapGrids. LiteMat Spectrum still holds the crown being one of the lightest fixtures available. TrueHybrid begins where our successful bi-color Hybrid system stops. Easily apply 100 shades of any color to full spectrum, camera-balanced white light. LiteMat Spectrum is the most camera compliant LED light fixture available. LiteMat Spectrum can improve post-production workflows with it’s unique and patent-pending color mixing process. A key feature of the new Spectrum platform is pixel control. A LiteMat Spectrum 4 is empowered with 4 large-format pixels allowing for just-right control of intensity, CCT, color or +/- green correction. Large-format pixel control adds a physical dimension of adjustment allowing you to position a lighting effect without actually moving the fixture. It’s like having 4 individually adjustable lights in one unit. During prep time, deciding what gear to use can be a challenge. Because LiteMat Spectrum can adapt to suit nearly any location or stage rig, its a safe choice that can cover those what-if moments. It can also help smooth pre-rigging stages with it’s vast mounting options and flexible color abilities. During principal-photography, speed is a major consideration. LiteMat Spectrum is lightweight and easily adaptable for practical locations and offers low-impact riggability. It’s also ideal for up-close setups right next to camera. Its wide color gamut easily allows you to augment nearby light or create the perfect white-light relative to the cameras white-balance settings. Once shooting is finished, this is where LiteMat Spectrum really can be a life saver. Because of it patented color processing engine and “color space compliant” output, colorists have the freedom to color-correct the image with fewer limits or anomalies. Full-spectrum color de-saturation and Rec 709 colorspace compliance saves valuable time and money during the color-grading process by allowing for improved post-production workflows. LiteMat Spectrum offers beautiful full spectrum white light with adjustable color-correction blended with any accent color in 100 shades of saturation. It all started with white balance. Digital cameras such as the Arri Alexa can often be “white balanced” to any CCT between two thousand and eleven thousand degrees Kelvin. It’s even possible to set the camera to compensate for plus / minus green cast. In addition to camera-coordinated white light, LiteMat Spectrum can produce saturated color accents. Intended to compliment your baseline-white, these colors are subtly blended with the balanced white light. This vastly improves the chromaticity of semi-saturated colors with full spectrum, and high CRI de-saturation (patent pending). This broad color-space is the basis of LiteMat Spectrum. Let the light fixture be able to produce the exact shade of white the camera sees as neutral. So we did, LiteMat Spectrum can produce white light between two thousand and eleven thousand degrees. And, it too can be set to compensate for plus/minus green casts such as from an automobile windows or available light. Meet LiteMat Spectrum, the first REC-709 colorspace compliant light fixture available, only from LiteGear. An all new approach to dimming. In order for LiteMat Spectrum to achieve the best and most reliable results, an entirely new and truly modern approach to control was necessary. The PDX dimming method embeds advanced high-voltage LED drivers inside the LiteMat head eliminating brightness variations do to long cable lengths. LiteMat Spectrum allows for up to 200 feet of cable between the head unit and PDX power unit without noticeable output loss. The LiteDimmer Spectrum DC200 is a 200 watt ballast designed to operate a LiteMat Spectrum light fixture with up to 4 large-format pixels each. It is power by any external DC voltage between 8V and 36V. The integrated OLED display offers important visual feedback and its included K-Mount offers best in class ballast mounting. 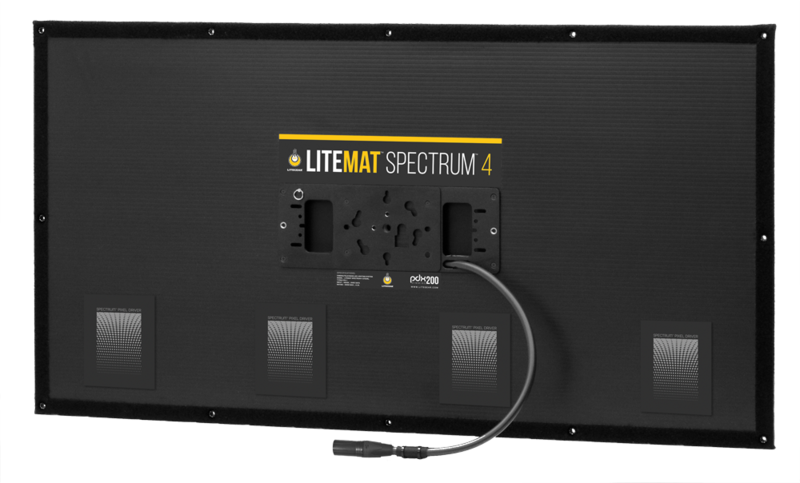 It is also the very first “LiteGear Spectrum Platform” controller and works with all 5 varieties of LiteMat Spectrum. Perhaps more importantly, it will also be the preferred controller for future LiteGear Spectrum Platform products such as LiteTile, LiteTile XL, as well as products from our future and current development partners such as Chimera Lighting, Skylite Balloons, and Hudson Spider. The PDX connection method is at the core of future compatibility. By combining increased DC voltage with our own LiteNet control protocol, the PDX system of connectivity allows for accurate control of the embedded electronics in the head unit regardless of cable length*. The Spectrum platform marks the beginning of a long-lasting and widely compatible system of light fixtures for cinema and television. Our goal is to provide interoperability between Spectrum fixtures from LiteGear along with future and existing development partners such as Chimera Lighting, Skylite Balloons, and Hudson Spider. User experience is the most important thing for us right now and we think the Spectrum platform, with its unified color-space, control-method and connectivity make it a wise choice for technicians, rental houses and future development partners. Maintain the unique functionality of LiteMat; thin, lightweight, rig anywhere, and provide light output that is a step beyond our bi-color Hybrid system. Hybrid is great under most circumstances, offering the ability to adjust CCT from 2600k to 6200K. Quite perfect for film cameras. When we looked at processes that could make that better, it occurred to us the “better” should be “better for camera”. Especially digital cameras. Copyright 2019 © LiteGear, Inc. Enter your name and email below to stay informed on this product updates.